Hi folks - Rob here - I'm new to ArtRage so thought I'd say hello. I've just purchased a Wacom Intuos4 as well as ArtRage and I'm loving every second of it! For my first go, I've decided to follow along with Henry Stahle's apple tutorial. I couldn't figure out how to get the layer texture to work out properly so it's a fairly smooth apple. But alas, I need to make some more posts before I can post my apple. Lol. Back to the forums! When I make enough posts, I'll be back to post my apple! Welcome to the Rage! This new adventure you are embarking on will be one that will bring you many hours of total inner joy! Again welcome to Art Rage and we all wait anxiously to watch you grow and become one of the great contributors to this wonderful community. Welcome to the forum Spitfire, looking forward to seeing your apple. Yes welcome Rob, looking forward to seeing your art. I couldn't figure out how to add texture to the apple from the tutorial, it was a little vague. 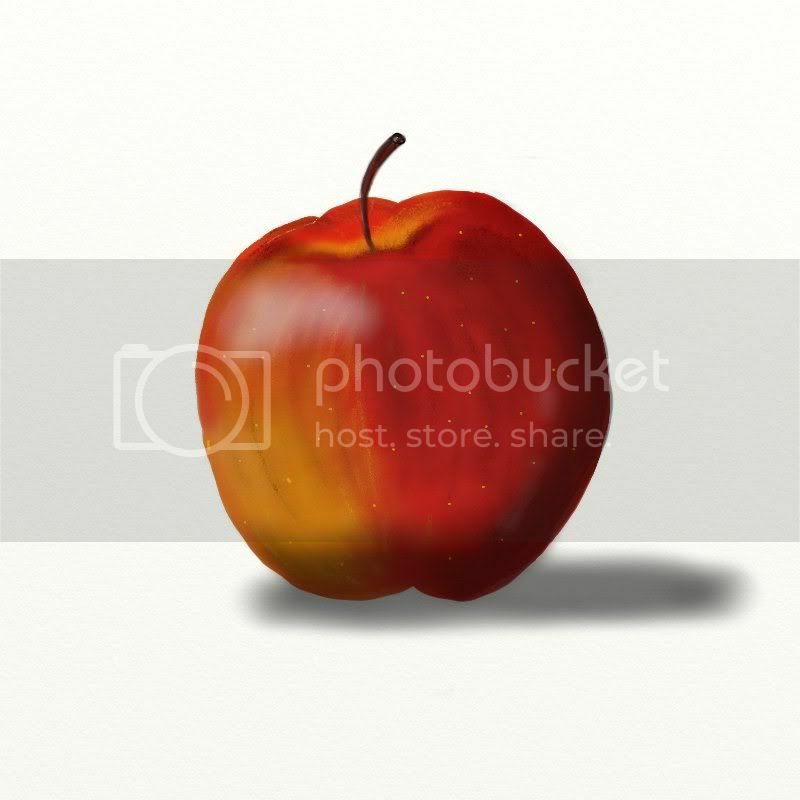 Can anyone help me out on how to properly add texture so I can make the apple a little less shiny and more realistic? rob... a fancy apple at that... welcome to the AR forum! Welcome to Artrage. Let me give you a couple quick tips like you asked for. In digital painting texture is king. I'm using Artrage studio 3.5 (not pro cause i'm poor) so you should be able to follow along. I took your image and sandwiched it be tween two layers. on the bottom layer I used a thick loaded brush and swiped some strokes underneath following the shape of the apple. Since your image is a solid opaque layer none of the color shows through from the layer under it but the texture does. On the layer above it the color of course dose show so matching your colors I used the pastel tool with very light pressure and touched up the highlights and shadows to rough up the surface of the apple. hope this helps.